September 23, 2011 by barbstruestories, posted in Beyond full time work, Interesting things..who would have known? I started blogging some 175 days ago when my friends at my workplace set up a blog site for me as a farewell gift. I then moved on from the sphere of full-time work and am now 5+ months into what I am calling my Next Chapter. My ignorance of blogging knew no bounds as I began blogging and some might say there’s been little change in my level of understanding. If you blog, the literature suggests you are encouraged to pick a theme. I read a blog that is all about baking and eating and it’s very good-I have baked from her recipes. I started out thinking the blog would be focused on my experience of eating my way through the dessert counter at Simply Biscotti, a local coffee shop/bistro in Little Italy, Ottawa, Ontario. Well, the best laid plans of mice and man… the blog morphed pretty quickly into more of a life-beyond-full-time-work blog. It’s not gone viral-like some of the things we hear of that have gone viral…and that may well be a good thing. But it’s been a chance for me to observe and report of a life’s experience when not in the workplace full-time. In retrospect, it’s not surprising I don’t have a single theme, like gardening or golfing or cycling or quilting or cooking or Simply Biscotti or hiking or cross-country skiing, or, or because there are so many things to experience when you are writing a new chapter in your life. In a way my career was a bit like that-when people would ask me about my career I would say my resume looked like I couldn’t keep a job. I was always looking for something new after a while-a new adventure, a new horizon and only once did I stay long enough to get a 10 year pin. I’m proud of that (although my manager had to work a bit of magic to convince the powers that it really was 10 years). But back to the blog and the stats. In the 175 days there have now been over 4,000 views!! While not viral, there are people having a look. I know people are looking because there are things like Site Stats and Akismet Stats that tell me how many views per day and which blogs are most frequently viewed. I know because people have left comments and a number of sent emails directly to me. I am thrilled that you and others have looked once..or twice…or maybe routinely. My husband says the views are likely made up of my own 3,900 views and the 6 times he has looked and a few miscellaneous viewers who stumbled on the site by mistake. Well he didn’t really say that but that was the gist of it. I showed him the bit on Word Press that says they don’t count my views on the site. Another friend who has more experience in blogging posted detailed stats about his blog recently. I don’t know how to find those stats yet but I plan to learn over time. I do know though that the blog titled Scotch and Chocolate keeps getting viewed. And I see now that Carol Anderson of GrapeScot who led the scotch and chocolate tasting has provided a link to my blog through one of hers….this is the world of blogging. I wonder if I could do a blog about drinking scotch and eating chocolate after cycling to the garden and then finishing the day with a treat from Simply Biscotti. Any thoughts on what I should write about next? It’s always easier to look back than it is to look ahead. I just had a quick peek at the bits I wrote about our garden earlier this year. There were 3-4 blogs about gardening before we put a seed in the ground and now, here we are, technically it’s still summer but everybody knows what comes next. Fall. Although the season isn’t over and we have yet to sit down and conduct an objective “lessons learned” review of our community garden plot-here’s some initial observations (objective or not). Beautiful-the few flowers that graced our land. 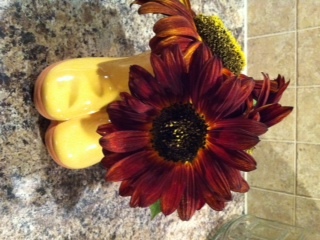 There were Shasta daisies earlier in the year and now sunflowers. Those sunflowers ended up being robust plants-to the point that they provided too much shade in some areas. We know that now for next year and we will adjust. Marginal (economists love the term)-the overall yield we harvested this year compared to our hopes. If I remember correctly we had dreams of bountiful crops-lots for us, lots for friends. Don’t get me wrong it’s not that we haven’t enjoyed produce along the way. A recent article in the Globe and Mail “Cashing in on an Urban Garden” mirrors our experience to some degree-except her yield was bountiful. 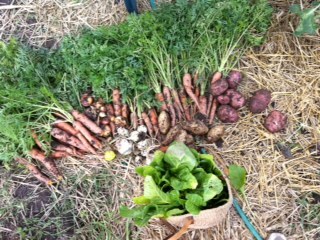 Adequate-our yield-enough for several meals but not a winter’s keep-recently we dug up carrots, onions, potatoes and took home more swiss chard. But fair to say compared to some neighbours our harvest was meagre. There are more vegetables yet to be harvested -this gives you an idea of our “take”. After digging up the vegetables you see above I took the fork and shoved it into the ground and took off my gardening gloves. There-we got that done! I need a statistics expert to help me to put the accident in context. Now there are 144,000 square inches in our 1,000 square foot plot. 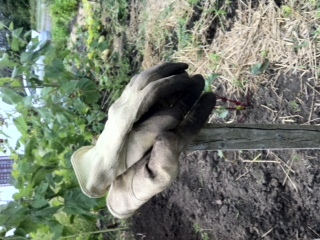 There are 4 tines on the garden fork-each no longer than 1 inch wide. Our garden hose is 3/4 of an inch wide. What are the chances then, that when I plunged the fork into the straw and the ground that one tine would go straight through our garden hose!! Excellent…that’s what the chances were-excellent. We are starting our list of purchases for next year-a garden hose is on the list. Gardening takes time….lots of time. Don’t take on a 1,000 square foot garden unless you will be able to dedicate time to keep on top of things. Next year holds great promise. Next year we’ll start sooner. Next year we’ll do this differently, next year we’ll do that instead of this. Next year the weather will be different. Next year. It is about the experience. Time with a friend, time to chat (while hunched over a row picking weeds and bugs). Meeting gardening neighbours and learning from their experience and their wisdom. It’s the smell of the dirt, the joy of watching things grow and the discussion about why they aren’t (usually we pin the lack of success on the soil and the weather this year-not on the two of us who are tending the soil). For those of you who have gardened, who garden now or know things about gardening, we welcome all advice and commiseration. Are there great references or on-line forums we should be checking out? We are all ears and we didn’t even try to grow corn. We finally made it to the Caravaggio Exhibition at the National Gallery in Ottawa this afternoon. We were not alone. Many others were heeding the information the exhibition is only with us for another week. I am no art aficionado and so won’t even try to make a comment. The linked article gives the history and the significance of Caravaggio’s art and tells you a bit about the man as well. You can work up an appetite walking 400 meters in an art gallery. A trip to Simply Biscotti for my spouse and me was the ticket. Simply Biscotti was busy too. All those people stopping in after their visit to the National Gallery. 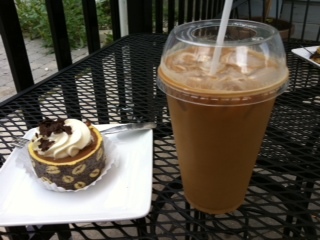 It was a hot and humid afternoon and an iced coffee with a splash of hazelnut flavoring and a touch of cream makes for a great drink on a hot day. 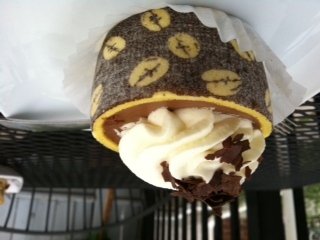 A chocolate mousse in a cake cup looked like a great match for the drink. The mousse had an almost mocha like taste. It was topped with real whipped cream and shaved chocolate. It was a nice size-not too big and not too small. The mousse was encapsulated in a fancy looking, possibly prefabricated cup of sponge cake. In my experience the fancy things like this look better than they really taste. I’d rather have a from-scratch exterior. To quote a friend “I’m just saying.” That said, I left nothing on the plate.